Step into the Holy Land of the Middle East on a journey that combines the highlights of Israel, Egypt, and Jordan. Discover what adventures lie along the desert scenes and the marvelous ancient city of Petra. 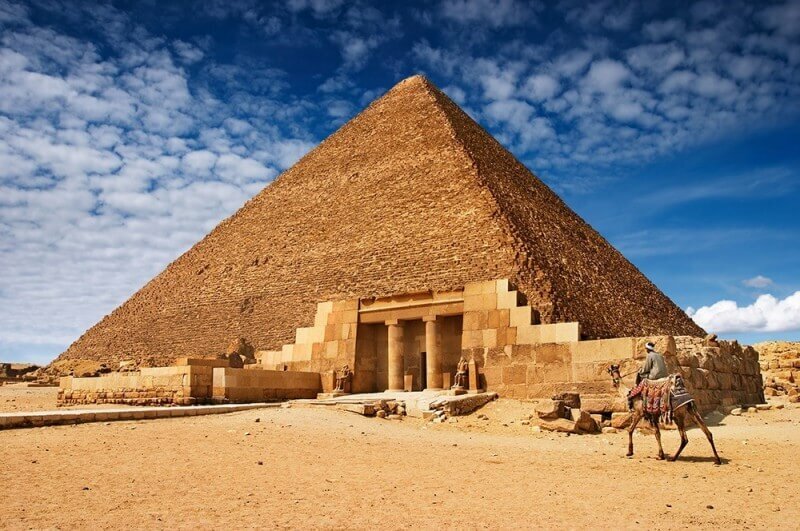 See for your own eyes the ancient temples, magnificent pyramids of Egypt, explore the lost cities in a region that has seen centuries of human history. Connect to the past with each country’s rich history going back thousands of ages. 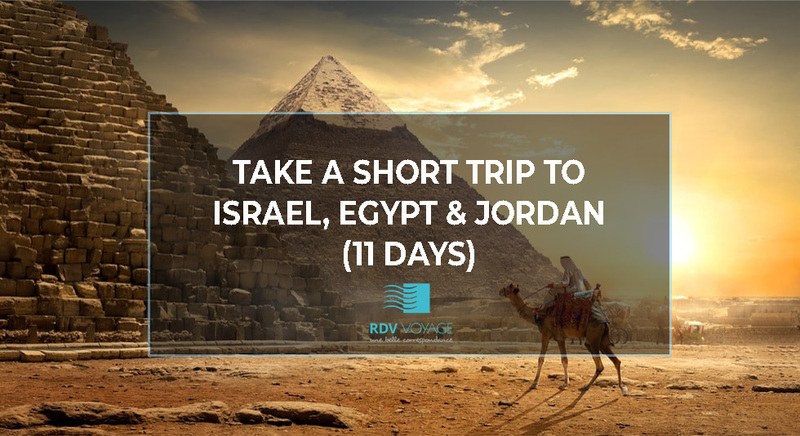 From its ancient period with pharaohs, mummies, and hieroglyphs to its medieval period, from the heartland of ancient Egypt to the Dead Sea and beyond with RDV Voyage. Bordering Egypt and the Gaza Strip on the Southwest, the famous archaeological site in Petra, Jordan to the east, Lebanon and Syria to the North, while Israel leaves itself wide open beautiful coastlines to West. 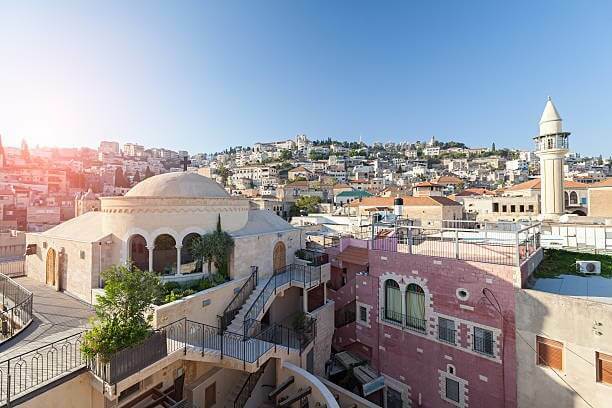 From biblical times to the present, this Holy Land in the Eastern Mediterranean has captivated visitors – the home of the Mount Olive, the ancient port of Jaffa, Red Sea and Sea of Galilee are some of the places to see in this beautiful country. In addition, they have the Mediterranean coastline offering everything from unique geological phenomena to coastal resorts. 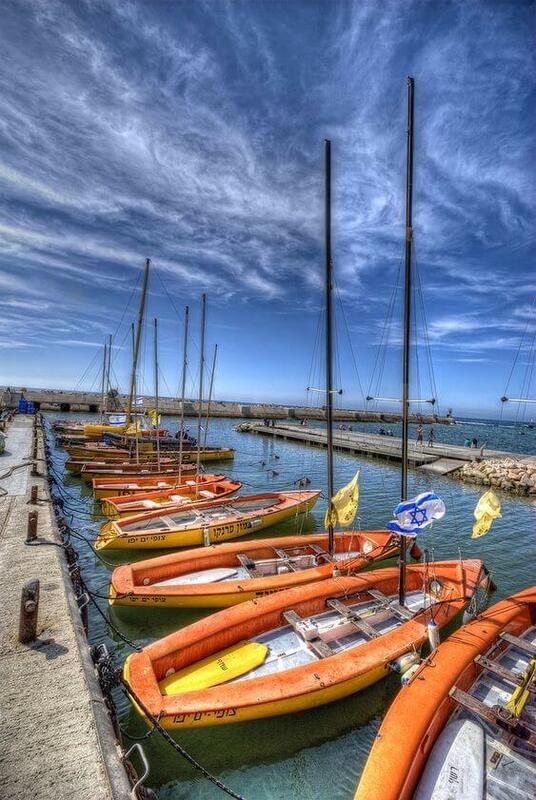 The oldest seaport in the world — the “Bride of the Sea,” as it was formerly called — city part of Tel-Aviv. Ever heard about Jonah and the Whale? It was in the Jaffa port when he tried to run away from the will of God being assigned to him. This is a very charming city to wander on foot and hear plenty of tales from its ancient past. Located halfway between Tel Aviv and Haifa, an ancient Roman city which was built on the shores of the Mediterranean Sea. 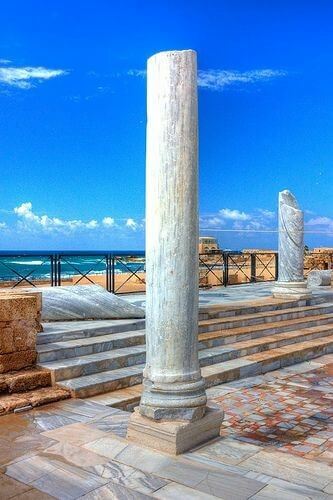 Home to an ancient Roman ruin, beautiful coastlines, a unique museum, and the ‘hanging’ Bahai Gardens, the UNESCO World Heritage Site of Acre, one of the oldest inhabited cities in the world constructed by King Herod from the Roman Empire. It’s a perfect place to enjoy a sunset and plenty of brilliant restaurants to favor around the town, with an impressive scene overlooking the Mediterranean. 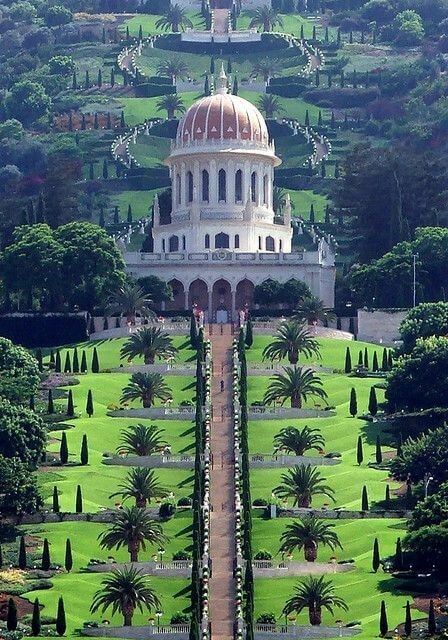 Set at the top of Mount Carmel – the main headquarters to the Bahai faith. The city of Haifa is the vast city in northern Israel. Dominated by Galilee to the north and east acting as a gateway to the north. From the top of Mount Carmel, take in the view from the Louis Promenade and across the post of Haifa heading north right across into the Western Galilee. The Bahai Gardens is the most definite tourist attraction. Every year, Bahai Garden attracts over million visitors. Pro-traveler tip: don’t miss the utterly beautiful garden with the bright blue skies! Located in the north of Israel, also called as ‘Arab capital of Israel’. It is most famous for its traditional Arabic market which attracts Israelis from across the region. All the grand memoirs from the pages of the holy book of Bible come alive the moment you step into Nazareth. You will never find so many historical landmarks in a single place! and of course, it is the Messiah’s home territory. Visit Galilee with whatever pace or theme you prefer- restful, spiritual, historical, recreational, etc.- each of these can be savored here. 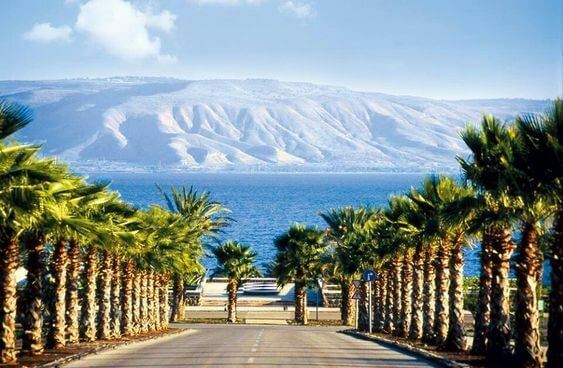 Blessed with charming forested hills, rich valleys, spouting springs and the sea of Galilee (believed to be where Jesus walked on water) are what makes this a highlight and must see when visiting Israel! Those seeking spiritual solaces – Jewish, Christian, Muslim, and Druze, Galilee is the place for you! 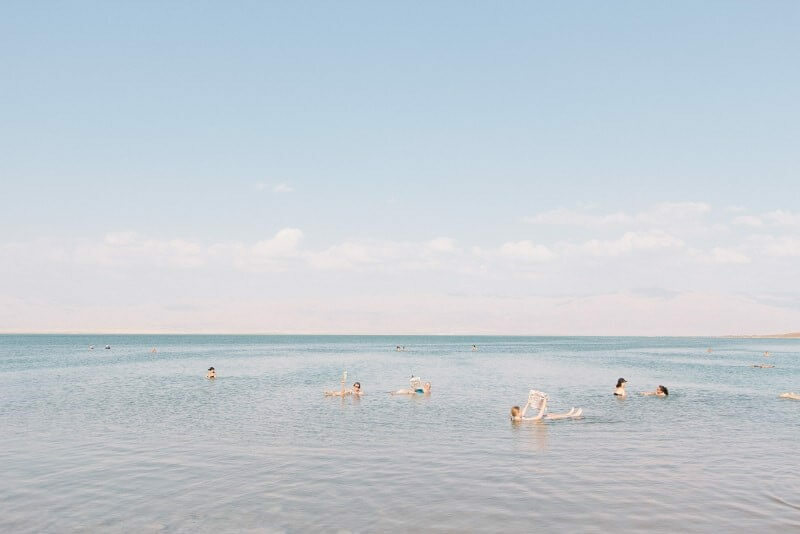 Salty lake on the lowest place on the face of the earth – the Dead Sea (431 a below sea level). An impressive natural beauty surrounded by the astonishing landscape of the Negev Desert. Recognized have good skin-treatment properties and the extraordinary feature that one can float effortlessly on water. 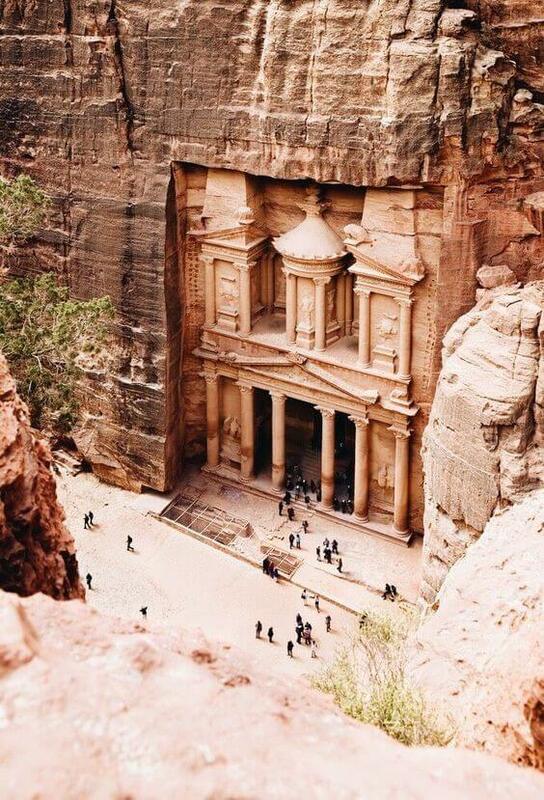 One of the New Seven Wonders of the World, the Lost City of Petra hides behind Southern Jordan’s pink sandstone cliffs. You may have seen Petra in films including The Mummy Returns, Indiana Jones etc. Petra has been constantly at the top of travel lists–to see in your lifetime. Prepare to be stunned as your eyes absorb the view to the only standing ancient wonder of the world, soaring in the top of you from the Giza road while approaching them. 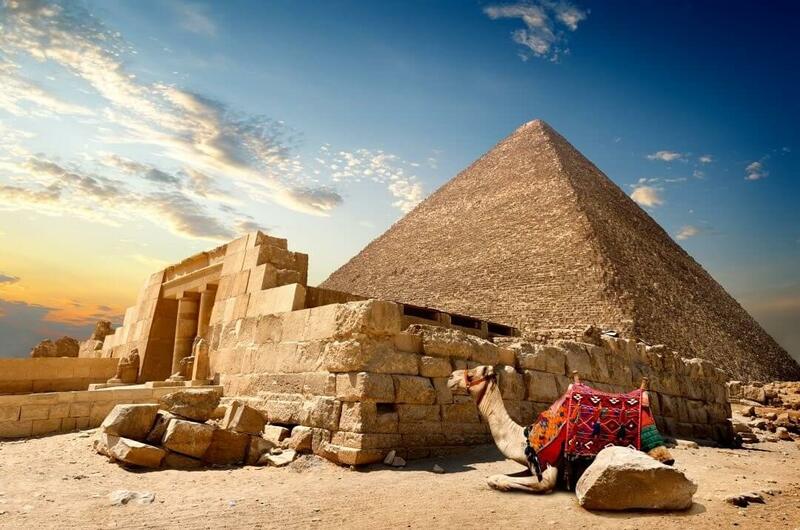 Egypt has what comes to be an almost boundless collection of appealing visitor allures but no visit is complete without seeing the great pyramids of Giza. Now, let’s get ready to hop unto the Ancient World with RDV Voyage! You’ll surely experience what “extraordinary” truly means. How much if its all in?